I wanted a 12″ sandbag, but was not willing to spend the $50 or $60 to buy one. I had some good scrap leather in the shop and made my own. I started by taking 6″ into my dividers. I drew two twelve inch circles on the back of my leather. And cut them out with some kitchen shears. 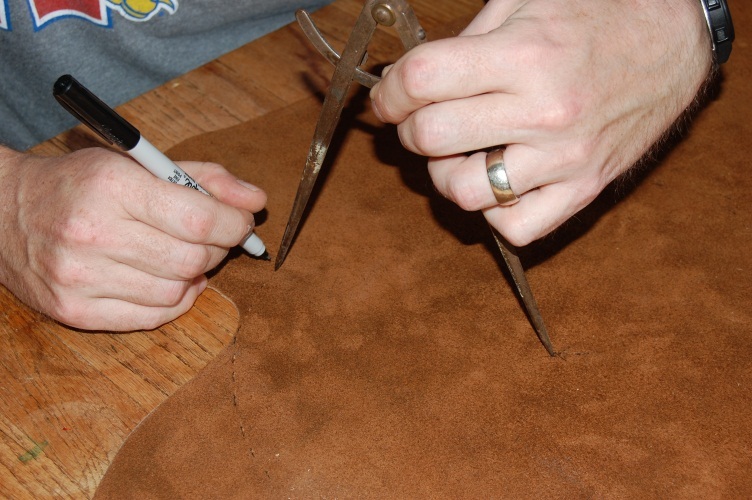 I find that good kitchen shears do a great job cutting leather. I ran a line of Barge Cement around each piece, skipping 1″ to allow for filling. I let the cement dry and stuck the two pieces of leather together. Next, I punched holes around the edge with an awl. 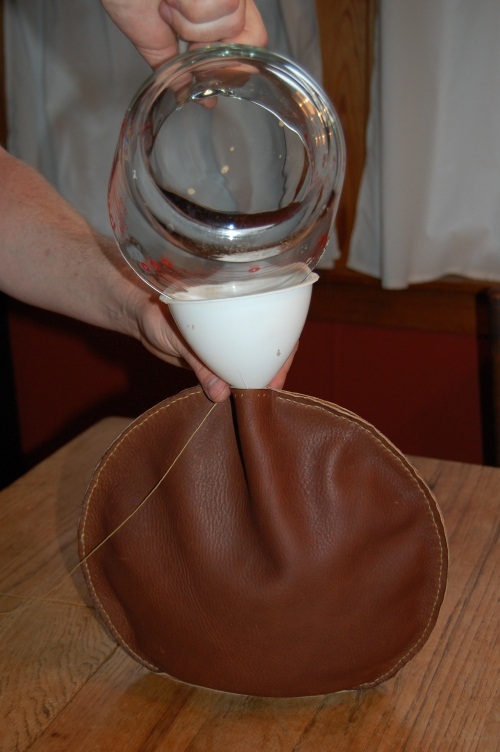 I used a saddle stitch and some strong waxed twine to sew the edges. All that was left was adding about six cups of sand. After pouring in the sand, I glued and stitched the last bit shut. 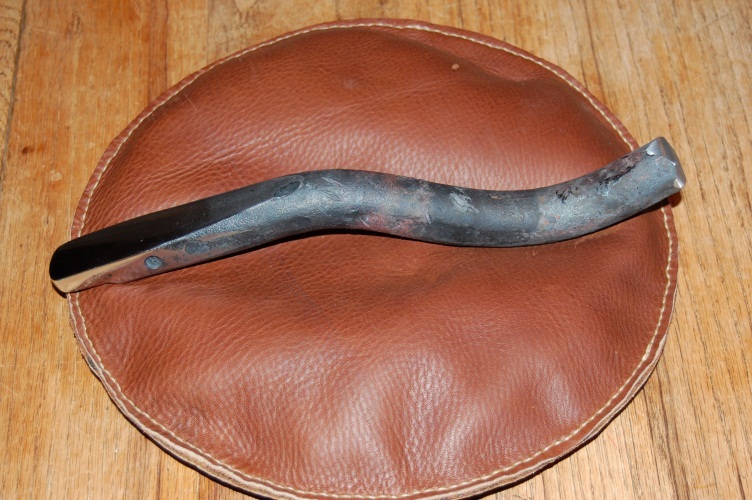 Here is the bag with a sheet metal forming stake that I have been working up in the forge. It started from a circus tent stake. One end is mostly done and the rough end will be a ball shape when I am done. 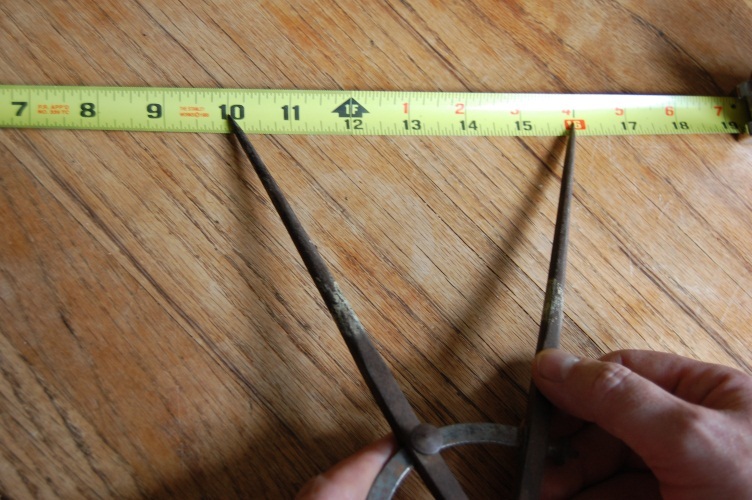 I had looked for some forming stakes to buy and was astounded at how much a simple T stake could cost. I found several that were three hundred dollars or more. Per normal, I went to the forge and shop and made one. This entry was posted on July 5, 2010 at 2:23 am and is filed under Blacksmithing, Forging, Leather working, metalwork, Raising Copper, Tool Making with tags leatherwork, metal forming, sandbag. You can follow any responses to this entry through the RSS 2.0 feed. You can leave a response, or trackback from your own site. i think this is just what i need! I love it. I have wanted one of these since i worked at an engingeering office and played with them while there, now i do jewelry making and STILL want one, but, like you said dont want to pay all that money for one. And it probably more since you put this on here… THANK YOU, THANK YOU!! Glad to hear that it inspired you! Thanks for posting this tutorial! I’ve been looking to buy a leather sand bag for my metal stamping but I agree…$50 or so is way too steep to pay for one!! I love the size of the one you made! Is there any difference in using sand as opposed to shot? Do you mean lead shot? Lead would work but it is toxic, that would be my concern. Take an old heavy leather jacket, suede is better, or buy a torn one for next to nothing at a thrift store. Cut a section about 7 inches long from a sleeve, choosing the size you want as sleeves taper. Sew over the cut ends and an inch onto the seam(s). I’ve made 6 of these in an hour or two from single jacket, kept one for forming, one for general holding (leave a bit under-filled for better conforming to the work piece), and one for supporting my restored 1930s engraver’s block. Gave the rest to students. Dry gravel or coarse sand work fine, shot is heavier and doesn’t compress as much as the pieces are larger and all the same size. Don’t use lead shot, steel shot is available for shotgun reloaders or you can reuse steel shot from those wearable ankle and wrist weights, again from thrift stores. 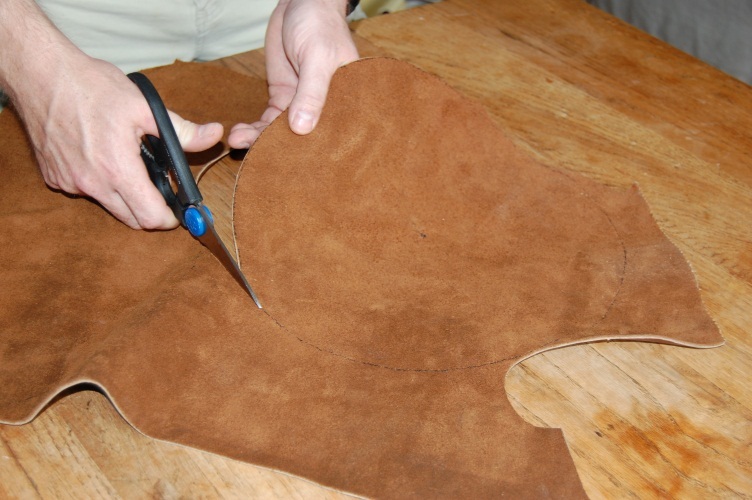 Use the rest of the leather jacket for other projects of course. Thanks Grimbold, those are great tricks! I know that this was posted a while ago but this is exactly what I am looking for! Thanks for posting it..